HONOLULU (November 5, 2013) — The 29th annual Quiksilver In Memory of Eddie Aikau, the original one-day big wave invitational surfing event that requires waves measuring in excess of 20 feet, is excited to announce the list of 2013/14 Invitees and Alternates. The holding period for the event begins on December 1, 2013, and concludes on February 28, 2014. The official Opening Ceremony with the Aikau Family will be held on Thursday, December 5th, 3pm, at Waimea Bay. After opening the selection process up to peer polling for another year, there has been much movement on the Alternate list, but only one newcomer to the Invitee list: the North Shore’s own Aaron Gold, 31. A dedicated father, quiet charger and shaper of his own big wave ‘guns’, Gold is precisely the kind of surfer who Eddie would have hand-picked. Aaron has been riding The Bay since he was around 13 years of age, but only emerged on the international scene during the past two years. Memorable performances at venues like Jaws and Cortes have been captured by the media, though many times with Aaron only being recognized as an “Unidentified” surfer. Driven purely by a love for riding big waves, with no sponsors to his name, Aaron Gold will no longer go unrecognized. “It’s hard to put into words,” said an elated Gold when hearing of his Invitation. “My whole life, growing up as a kid here in Hawaii, that’s the ultimate prize, to be invited to the Eddie. When you get that invite, it’s like you’ve accomplished what you set out for. Crazy dream. Dream come true for sure. 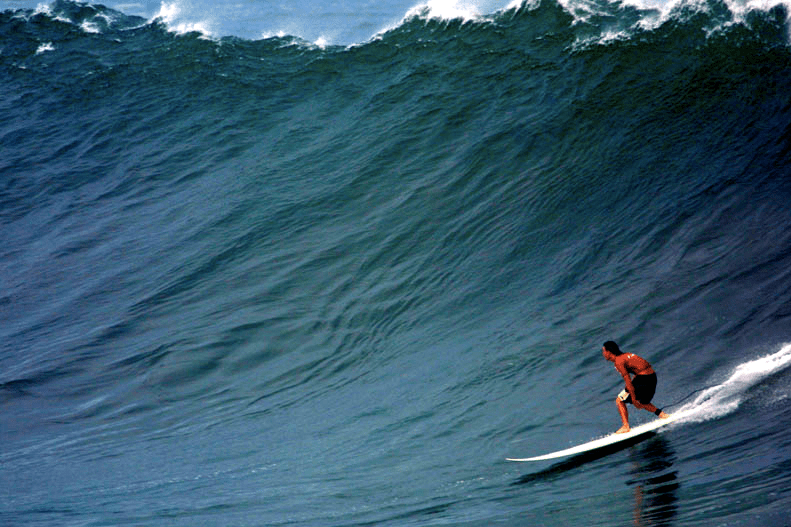 “I paddled out (Waimea) the first time when I was about 12 or 13. I was riding like a 7’0” and it was the biggest board in the world to me. I just got annihilated. Just got blown up and thought I was going to die, and from that point it turned me to really want to surf big waves. That started my love for (Waimea) and it’s really a special place for me. The Quiksilver In Memory of Eddie Aikau has only been held a total of eight (8) times, most recently on December 8, 2009. California’s Greg Long took the honor that year. Quiksilver is committed to providing tools for uncovering, expressing and expanding your personal style. Our aim is to foster the sense of individual expression and excitement – the stoke that is the essence of boardriding. We’re also here to spread the word because the only thing better than finding stoke, is sharing it. Boardriding is about timing and style. It’s youthful, active, casual, and free flowing. There is no wrong way to ride a board. The goal is simply to learn, progress, improve, and give it your own interpretation. Next The 3rd Annual Steep and Deep Pipeline Photo Challenge Has Begun!